Selfridges department store at 400 Oxford Street was damaged in 1940, 1941 and 1944. 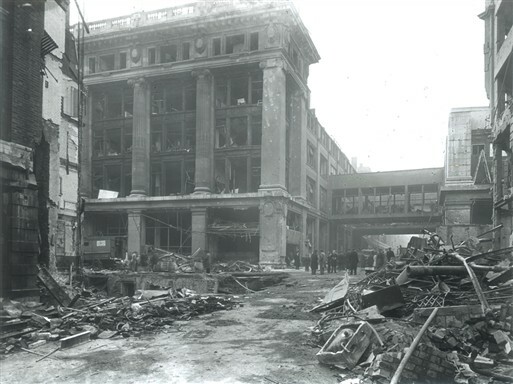 On 18 September 1940 – in the same raid which destroyed John Lewis’s further east along Oxford Street – Selfridge & Co Ltd was hit by a single high explosive bomb and by several incendiaries. The store’s elegant roof gardens – popular since 1910 as a place for strolling after shopping – were wrecked by blast and closed to the public. Broken glass from Selfridges’ many upper storey windows fell into surrounding streets. Owner H.Gordon Selfridge’s prized signature window - autographed by dozens of celebrity visitors to the store since its opening in 1909 - was shattered. The sight reportedly reduced the retired 84-year-old American retailer to tears. Selfridges' magnificent Art Deco lifts, installed in 1928, suffered flood damage and were rendered inoperable until the end of the war. 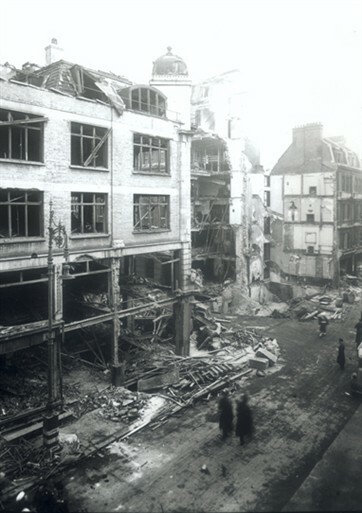 After the 18 September raid, the ground floor windows – normally used for the store's world famous shop front displays - were bricked up for the war’s duration. Selfridges had survived, but with serious internal wounds. 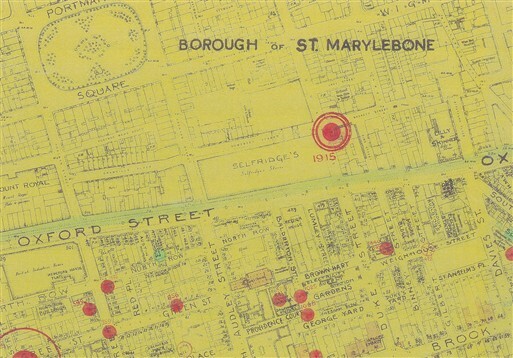 St Marylebone Civil Defence records detail further incendiary bomb damage inflicted in the night raid of 16-17 April 1941. In this attack, fire destroyed the store's Palm Court Restaurant, venue for the rich and famous. Despite the damage of 1940-41, Selfridges was keen to show its continuing commitment to Allied victory. The store hosted Utility fashion shows and mounted exhibitions and window displays with wartime themes. It was also to play a more important role as the war progressed. 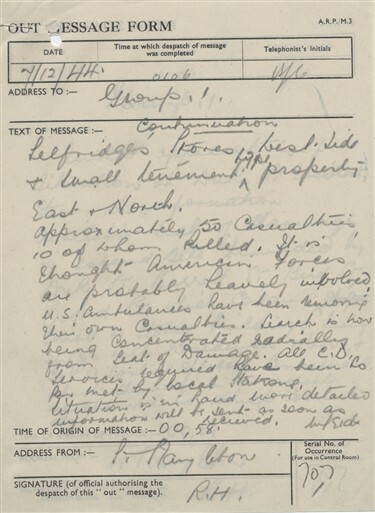 One of Selfridges’ sub-basements was converted to hold a secret Bell Telephone ‘X-System’ communications system. 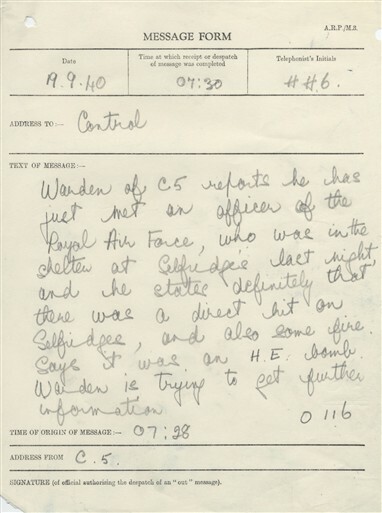 Codenamed ‘Sigsaly’, and operated by US Army technicians, specialist cryptographic signal equipment scrambled top-secret phone calls between Britain and her Allies. “ We worked under ground under Selfridges and if we were on night duty we had to sleep in bunks in the tunnels where there were rats. We didn’t get much sleep but it was preferable to trying to get home in the small hours if there were bombs going off. 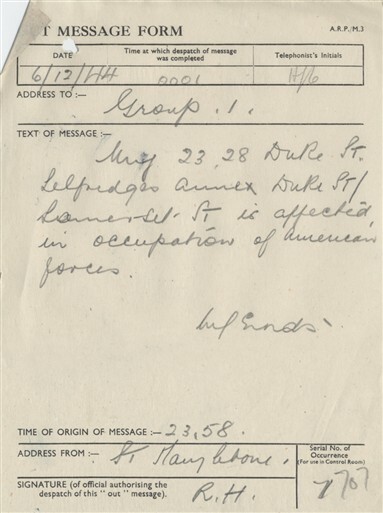 The place itself was bombed and the soldier who was on guard was killed. We didn’t know what to do when we arrived in the morning because we couldn’t get in. We were simply told we would be contacted”. 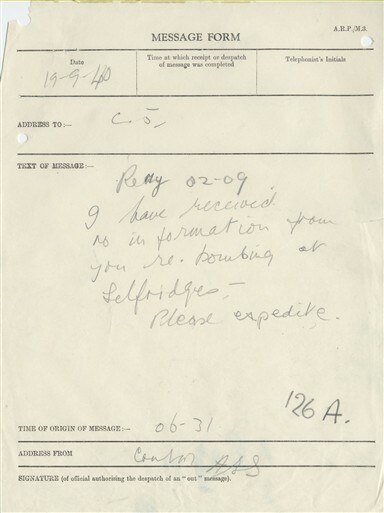 In a memo to staff, H. Gordon Selfridge praised their swift response and their courage. The next day, 7 December 1944, Selfridges was again open for business. 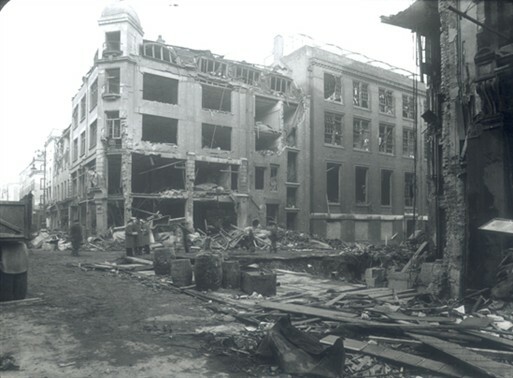 V2 strike opposite Selfridges, 1944 (Duke Street/Barrett Street). 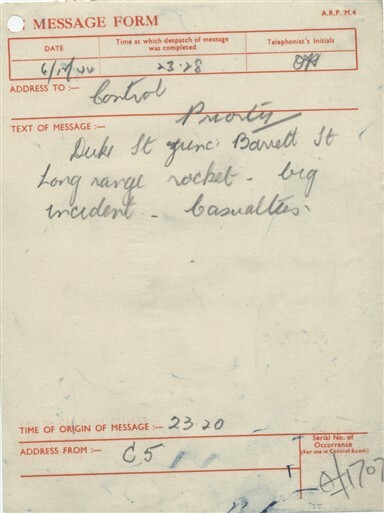 My father, Leslie Sore, worked in Selfridges during the war. He earned extra money by doing night duty on the roof of the store and kicked incendaries off the roof during the raids. He remembered one night when a bomb had exploded and a window display of surplus paint tins had been blown into the store turning all of the internal columns of the building multicoloured. He also remembered that a limousine carrying a lady drove into a crater caused by the bomb, the lady was killed as she was flung through the glass divide inside the car. My father completed 40 years service with Selfridges and they acknowledged his service during the war when he retired in 1976. He died in 1989 aged 76. I am very proud of my parents; both worked in the basement of Selfridges for the War Office during WWII. My father was in the US Navy and my mother was British. I am only just beginning to piece together, thanks to my mothers help, what they did for the Allied cause. My mother was involved with sending 'false information' and my father in covert ops. His nickname was always 'spooks'. My mother was kept in the dark about his missions and sadly we no nothing of them. He was involved in missions, we believe, to France teaching the resistance how to make radios, etc. I am hoping to find someone who will be able to give me more information. Again, I am very, very proud of the work my parents did during these times.